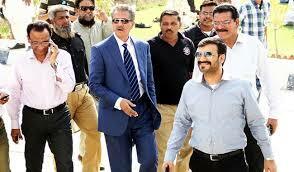 KARACHI: Mayor Waseem Akhtar on Thursday said urged the Karachi Metropolitan Cooperation (KMC) officers to bring further improvement in the recovery of illegally encroached land and achieve their target by June 2018. He said this while presiding over a high-level meeting of the heads of revenue recovery departments of KMC. He said as only collective efforts could make the organisation better and strengthened, effective methods should be employed which could enhance the revenue resources. The meeting was also attended by the Metropolitan Commissioner Dr Asghar Abbas, Land Committee Chairman Arshad Hassan, Finance Committee Chairman Nadeem Hidayat Hashmi, MUCT Chairman Rahat Siddiqui, Director Technical to Mayor S.M Shakaib and other officers. The mayor said though some improvement was seen in the recovery performance during the third quarter of the fiscal year, we still have to work hard to achieve the full target for the year. He said the list of all empty plots be provided along with details of NUF Recovery and the empty plots be marked with such signs that could show them as the property of KMC. He also directed that matters pertaining to Karachi Development Authority (KDA) should be resolved, separately. He said the auction is not the solution for every problem and we must use other ways and means which could make the situation better. During the meeting, recovery position of various departments was presented to mayor along with their targets till March 2018.